Exhibition: James and Emma Hadfield, legacy of a Loyalty Islands mission, 1878-1920. Le Musée de Nouvelle Caledonie, 4 September 2013 – 4 February 2014. 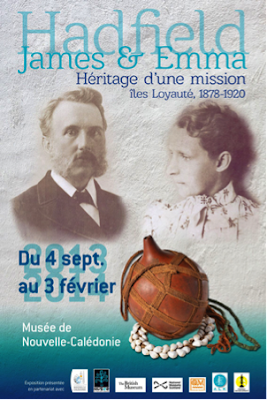 This week the exhibition James et Emma Hadfield, héritage d'une mission, îles Loyauté, 1878-1920 opens in the Musée de Nouvelle Caledonie (MNC). A landmark exhibition it displays for the first time in their country of origin a proportion of the collections made by James and Emma Hadfield, British missionaries resident in the Loyalty Islands. The idea for an exhibition began with the generous donation of over one hundred artefacts to the MNC from the present descendants of the Hadfields. In 2008 the family brought together all objects remaining in private family hands and returned them to Noumea, the capital of New Caledonia and the site of the museum. Since their arrival and in anticipation of the exhibition the museum has worked in partnership with the Loyalty Islands regional council and invited weavers, elders and cultural workers from the Loyalty Islands to view, learn from and supplement the information recorded by the Hadfields at the time of the collection. It was Emma Hadfield who became the driving force and main collector of artefacts during their residency in the region, recording local names and stories about the culture they encountered which were eventually brought together in her book Among the Natives of the Loyalty Group (1920). Her collecting was anthropological in style and scope, she entered into correspondence with the British Museum and collected at their specific request. The collection now residing in the Museum of New Caledonia was once on loan and exhibited by the National Museums of Scotland (NMS), in Edinburgh one of two collections of 105 object and 94 objects each lent to the museum in 1910. Although both collections were put on display the smaller was quickly purchased by NMS and the other remained on loan until the 1960s when it was returned to the family. The exhibition opened in Noumea on 4 September and brings together artefacts from the permanent collections of all three institutions for the first time. The exhibition comprises four areas, the first introduces the Hadfields, their lives on the islands during the forty years that they spent there. The largest area displays the collections from the Loyalty Islands covering themes of Chiefs, their status and power; domestic life; social life, dance and music; and warfare. Highlight objects include jade necklaces meciwe; elegant baskets and mats; and a fine club decorated with flying fox fur and cowrie shell. Within this section is an audio area where visitors get a sense of the Hadfields’ lives and the stories that Emma collected whilst in the region. Visitors can listen in French, English, drehu and iaai the languages of the islands of Lifou and Ouvea where the Hadfields were resident. The final area consists of large visuals showing Loyalty Island life today and the Hadfields legacy, topics covered range from leisure activities such as the women’s cricket leagues, the introduction of mission dresses which are worn in villages today; education and school life; and examines the life of ministers and their wives in the communities today. A catalogue will be forthcoming to accompany the exhibition. This catalogue will also provide an overview of the many other institutions that house Hadfield material, including the Pitt Rivers Museum and Australian Museum in Sydney. Also opening next month in Paris at the Musée Quai Branly is the exhibition Kanak, L’Art est une parole featuring Kanak (New Caledonian) artefacts from across Europe and including over 60 items from the Musée de Nouvelle Caledonie. This exhibition curated by Emmanuel Kasarhérou former Director of the Jean-Marie Tjibaou Cultural Centre in Noumea and Roger Boulay renowned expert in Kanak material culture is the culmination of three years intensive study documenting the 133 collections of Kanak material to be found in France and promises to be a comprehensive and informative exhibition.